AC/DC: "We're just behind The Beatles"
AC/DC have appeared on 'shock jock' Howard Stern's satellite radio show, to mark the launch of new single Rock 'N Roll Train. In the interview we find out that Angus Young started playing guitar "at five or six" years old, and that he only learned to count "after we'd had a few managers". Astonishingly, Young also reveals that AC/DC have sold more albums since 2000 than they did in the previous 26 years of their career. (At least, we think that's what he means - it's hard to tell). 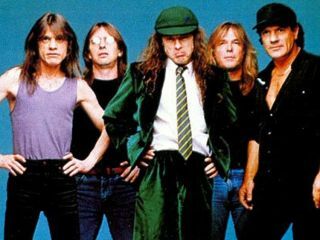 Though in the last eight years, AC/DC have released only one album of new material, Stiff Upper Lip, from 2000 itself. Meanwhile, Johnson claims AC/DC are now only just behind The Beatles in global album sales. While the singer is obviously being slightly forgetful about the careers of, for example, Led Zeppelin and Elvis Presley, he does reveal that the band are still hoping for a big commercial success with Black Ice. The album is released on 20 October, with Wal-Mart, Sam's Club and AC/DC.com selling it exclusively in the US. Young claims Wal-Mart have ordered three million copies of the album. Listen to part 1 of AC/DC on Howard Stern. Make sure you visit MusicRadar tomorrow (late pm GMT / Tuesday 16 September) for an exclusive track-by-track preview of AC/DC's forthcoming album, Black Ice.